with Robert M. Schoch, Ph.D. Heaven To Earth invites you to join world-renowned geologist, scholar, and bestselling author, Dr. Robert Schoch, for an incredible 7-day comprehensive cruise exploring the archaeology, history, culture, and natural beauty of stunning Adriatic; the region rightfully referred to as the “Jewel of the Mediterranean”. greet, welcome drink & light snack. Settling in cabins, departure at 3 PM toward Zlarin. Arrival to Zlarin 5 PM – guided tour. After breakfast departure for the panoramic cruise through National Park Kornati and Nature Park Telašcica. Upon the arrival, free time for swimming in the nearby bays and beaches. Lunch & dinner on board. Overnight in the village Sali on island Dugi Otok. After breakfast visit to mysterious town Asseria, one of the largest andmost preserved megalithic sites in Europe! More than one researcher remarked that the monumental walls are reminiscent of the walls of Jericho. The mainline history books say it is a Roman and Liburnian settlement, but there is hardly an official historic context to fit such a monumental town. On this magnificent site we will be able to trace multiple layers of ancient history through observing distinctive building styles: from ancient Phoenician, Liburnian and Roman to post-Roman, and try to reconstruct a plausible context for this archaeological wonder. Overnight in Zadar. After breakfast visit to Ivinje, an ancient megalithic necropolis. A fitting place for the initiation in the mystery of the sepulchral stones of the Balkans, usually called stećak. The necropolis is one of the rare ones surviving to date on the coast. The current mainline history places these monuments in the Middle Ages. However, evidence for their antiquity is overwhelming and, as it happens, ignored. As the necropolis shares the same location with a medieval complex, we will be able to spot the differences. We sail to island Murter – free time for swimming and sightseeing. Overnite in Vodice. After breakfast we leave for Skradin and visit Krka National Park. 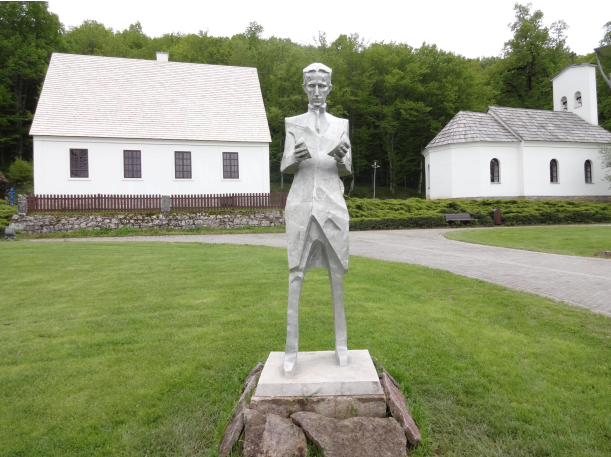 Visit to Tesla’s birth place and Museum. We will also stop to see a sepulchral stone which we usually call – the totem. 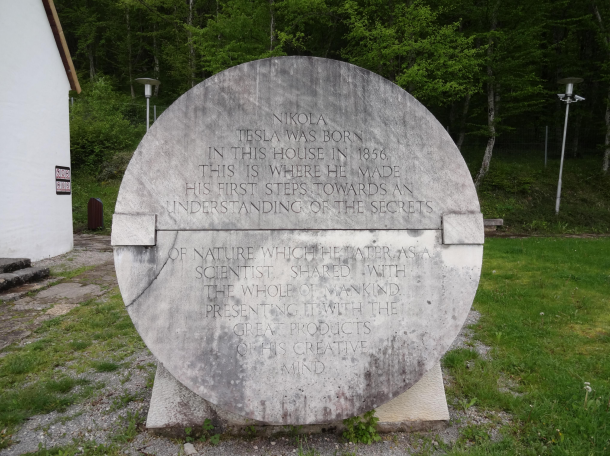 In the Sonković village near Skradin there is a strange monument, probably also a sepulchral stone, but standing upright like no other. We will explore the symbolism of its ornamentations. Overnight in Šibenik. After breakfast we sail towards Primošten. Stop for a swim in a bay on island Ugljan. On our journey we will visit an ancient megalithic wall near Žirje, dated at least to 6th century BC that the folk tradition calls Teuta’s Palace. (Teuta was an Illyrian queen and the charismatic arch enemy of the Romans.) Above this wall there are remains of a hillfort from the Justinian times and, above all, a medieval fortification. Again, a wonderful place to observe multiple layers of history and spot its retrograde movement. Also, Near Primošten, in a village called Grebaštica, we can see another ancient necropolis and the continuity of the use of the sacral sites in Dalmatia. The necropolis probably originates from deep antiquity, but we can trace continuity through the Roman times, Middle Ages and all the way to the present. On this location we can also see another Dalmatian specialty, a dual church, very unusual in the Christian tradition which probably points to old Manichean cults. After breakfast on board we depart for island Brac, we stop for a swim in the famous bay. Brač is one of the most interesting islands in the Adriatic and a wonderful source of ancient wonders. We will see the Dragon’s Cave, still inexplicable shrine with beautifully stone – carved monuments of esoteric Christianity. The mainline historians disagree as to the origin of these carvings for no less than 15 centuries. This is a very appropriate place to dive into the mysteries of early Christianity. It is not widely known that Christianity as a state religion was brought to Rome from Dalmatia, not the other way around. We will see why Dragon’s Cave probably was a sanctuary of an ancient oracle. 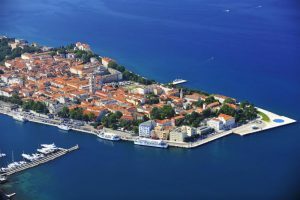 Also visit to town of Škrip is the oldest settlement on Brač by tradition and, also by tradition, the birth place of Saint Hellen, Diocletian’s concubine and Constantine’s mother. Here we will be able to see an ancient megalithic wall predating Rome and an unusual megalithic tomb in a tower, from the Roman times in which, by tradition, Diocletian’s wife and daughter were buried. We will be able to see the local museum with many interesting artifacts and, quite appropriately, the church of Saint Hellen. Captains dinner on board. After dinner we sail back to Trogir and overnite in Trogir. Disembarkation at 9:00 AM City Port Trogir. 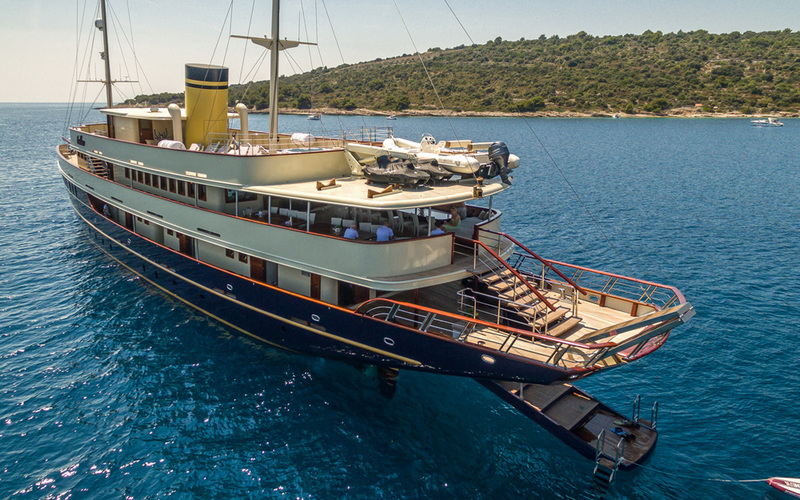 The most luxurious ship available for charter in Croatia, Casablanca will give you incredible comfort in specious salon, lounge bar with piano, huge open area terrace for leisure and sunbathing. Sauna, wellness zone with massage on board and sundeck bar are just some of the facilities on offer. Twin / double bed cabins feature air conditioning, wireless internet and LCD TV’s. Healthy vegetarian meals (meat & fish options available) and there’s an abundance of fresh fruit & natural spring water, herbal teas,longevity elixirs and smoothies. The Casablanca boasts an on-board Jacuzzi, serviced open-deck bar, sauna and wellness zone with spa services on board, sun loungers, and free WIFI. We offer a range of Spa services aboard the yacht, including Esalen Massage®, Deep Bodywork® and Amethyst Crystal Biomat. **Yacht selection subject to change due to number of participants, not to exceed total of 38 people on board. The total cost of the cruise is $3850.00 USD. We are currently offering early bird special: pay your deposit of $850 now and in full by January 31, 2019 and your total cost is only $3.500. All payments received after January 31, 2019 will require full cost of $3.850. your passport information and your emergency contact information. 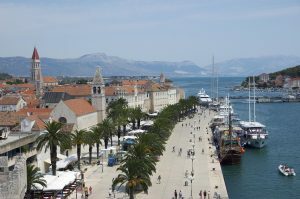 Trogir is a harmonious stone town on a small island which is connected to the mainland and the island of Čiovo by bridges. The old town, under UNESCO protection, is a treasure trove for lovers of Art, Renaissance and Baroque buildings and Romanesque churches. It is called the town-museum which is visible in the famous portal of Trogir cathedral by the craftsman Radovan in 1240, a Renaissance city lodge, the thousand year old Monastery of sv. Nikola [St. Nicholas] which has the ancient famous relief of Kairos preserved in it from the 4th century BC. The small, narrow streets and small village squares, numerous restaurants, cafes, souvenir shops and galleries, along with numerous cultural and music open air events give this town a special atmosphere of the Mediterranean. 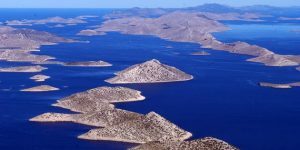 The Kornati archipelago is a special group of islands located between Šibenik and Zadar. It covers about 320 km2 and includes around 150 land units located either permanently or frequently above the sea. The archipelago makes 12% of all the islands in the Croatian Adriatic – 1264 islands, 67 of them inhabited. It has been long attracting the attention of yachtsmen, divers, mountaineers and other nature lovers. Zadar is a town that has antique origins with the most researched Roman forum on the eastern side of the Adriatic and late Roman church – the cathedral of St. Stošija [St. Anastasia], Sv. Krševan [St. Krsevan] and the famous Sv. Donat [St. Donatus]. With its valuable collections, libraries and archives, Zadar is proud of the fact that the foundations of the oldest Croatian university were laid here in 1396. Recently made even more famous for its Sea Organ, an architectural miracle on the Zadar riva (sea front). Alfred Hitchcock was so impressed with Zadar and its sunset that he said that from the Zadar riva ‘one can enjoy the most beautiful sunset in the world. If you go to the nearby old town of Nin, you will find the smallest cathedral in the world – Crkva svetog Kriza (Church of the Holly Cross), that is only 36 paces long. Not a long way from Šibenik, in a beautiful cove encompassed by various islands and islets there is Vodice, one of Croatia’s most clean towns. Its closeness to the Kornati archipelago and waterway Krka gully with delightful waterfalls, and additionally the great state of the town, shorelines and parks, makes Vodice an alluring and appealing traveler goal. As a residential area, it lives night and day, and dependably offers something new and unordinary. The most celebrated are the Vodice customary people celebrations, Easter and Christmas traditions, social and excitement occasions, celebrations, nighttimes of Dalmatian a’cappella melodies, sports rivalries: regatta, enormous diversion angling, cycling… Its rich nightlife and excitement makes Vodice a standout amongst the most appealing towns on the Adriatic. 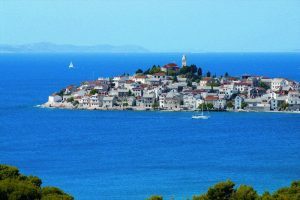 Whoever has gone to Vodice once dependably returns! 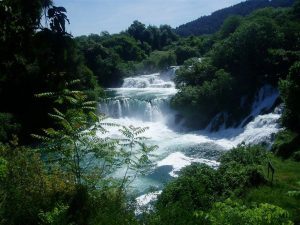 Stretching from the western foot of the Dinaric Range into the sea near Šibenik, the 73km Krka River and its wonderful waterfalls define the landscape of Krka National Park. The waterfalls are a karstic phenomenon: over millennia river water has created a canyon up to 200m deep through limestone hills. It’s the most dramatic natural sight in the region, but there are also several artificial sights within the park that are well worth the effort of reaching. 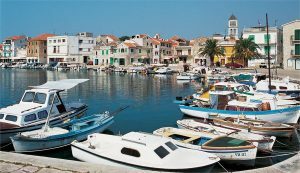 Once an island, Primošten has preserved the atmosphere and all the architectural features of a medieval Mediterranean fishing village. The town is dominated by sv. Juraj [St. George] on the highest point of the former island, and the Church of Gospa od Milosti [Our Lady of Mercy] and the chapel of sv. Roko [St. Rocco] certainly attracts our attention. Naturally sheltered from the winds, surrounded by vineyards woven into a stone honeycomb, at the foot of the hills there is Kremik marina which is unique on the Adriatic. The view of the Babić vines in their stone cells on the nearby slopes is a special experience and testimony to how man’s hand can enrich and fertilize even the harshest landscape. On the Raduča peninsula, to the north of the town, in a pine forest, there are hotels and beaches with a wide range of facilities. The famous Zlatni rat beach spreads to the west of Bol – island Brac and is one of the biggest and most beautiful natural beaches on the Adriatic. Like a tongue stretching almost half a kilometre into the sea, it grows with the drifting deposits of tiny pebbles, changing its shape depending on the wind and the direction of the waves. Bol is a paradise for surfers because of the favourable wind, which always blows. There is an array of high-class hotel complexes and private apartments along the beach and the coastal promenade.In the vicinity of the town centre are a baroque summer house, castle, parish church and the small square “pjaceta”.On the eastern side, a Dominican monastery, one of the most beautiful in Europe, rises on the Glavici peninsula.Only two hours walk from Bol are sites of exceptional value – the Blaca desert (church and monastery from the 16th century) and Zmajeva spilja (a cave rich in reliefs, and home to Glagolitic priests). purchase your round trip flight to Split, Croatia. however most places do take major credit cards. as laptops and many battery chargers only require the plug adapter. Please check your appliances directly for their specific requirements. need this medicine in case you need further medication. if you are sensitive to the warmer weather. • An extra foldable/crunched up bag- if you plan to do any shopping. effects of jet lag from long flights excursions. good choice for our Megaliths treks. English and most likely another language like German or French. Croatia. You can then use your phone just as you would a pre-paid phone. remember to bring your phone charger with you and an adapter. accommodate your usage needs without the need for a SIM card. vegetarian options. Food is safe to eat, and is usually of a good quality. remedies like raw ginger, or ginger tea. Bottled water will be provided on all excursions. day’s excursion. You are always welcome to opt-out of site visits. is a fair price range. Please ask for assistance when you are unsure! Orthodox church, where his father was a minister and a multimedia center. 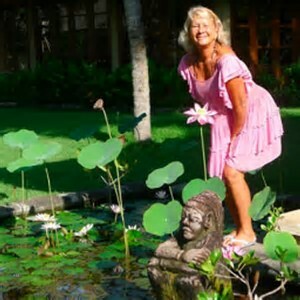 Ellen is a teacher of Esalen® Massage, Gabrielle Roth’s 5Rhythms, Holotropic Breathwork, SpiritDanceSoulSong, The Art of Essential Touch and Your Body is a Musical Instrument. From 1984 through 2003, Ellen developed and administered the Movement Arts Program at Esalen® Institute – www.Esalen.org. 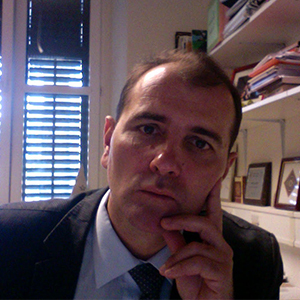 Domagoj Nikolic is a researcher of Ancient History, Megaliths, Sacred Sites and Archaeoastronomy, focusing on the Balkans. He is a member of an international multidisciplinary scientific team specializing in archaeoacuostics called SB Research Group, functioning under the auspices of the University of Trieste. Domagoj will be our Guide exploring Ancient Megaliths in the Adriatic. In 1996 Ellen founded MovingVentures School, a 501c3 non-profit educational organization focusing on women and men in developing countries. MovingVentures faculty offer workshops, retreats and trainings around the globe -in USA, Indonesia, China, Japan and Europe. Included in our time together will be introductions to Mindfulness Practices including Esalen® Massage & Bodywork, Touching Essence, Aquatic Bodywork, Sensory Awareness Meditation, Gestalt Practice, Personal Inquiry Exercises, Holotropic Breathwork, Meditation, The 5Rhythms, SpiritDance/SoulSong, Continuum Movement and Releasing Trauma. The Croatian Islands and mainland’s stunning setting, gracious living and workshop spaces create an ideal environment for abiding in nature while returning to the wisdom of your senses and your body. Join Ellen Watson in warm waters of the Adriatic Sea and the magic of Croatia.